Circuit bent sega mega drive from Gijs on Vimeo. Circuit Bent Sega Mega Drive 2 from Gijs on Vimeo. Gijs is a Dutch circuitbend-wonder. He bends gameconsoles, synthesizers, social softwares, applets, HTML, the internet as a whole and sometimes not yet existing technologies. He vjs with his equipment and sometimes also plays music, mostly on the gameboy but sometimes on other instruments. "Jakob Lodwick: Would you believe I felt bad for the game? Like you were exploiting it. Weird. Gijs: well.. i guess I'm exploiting it.. but if you have played the game already, playing it on a circuitbent console will make it more difficult to play the game. so i thing the game will feel not to bad about that.."
Raúl Berrueco and Raquel Meyers founded Entter as a collaborative platform focused on New Media art and design. Its current member is Raúl (Santander, 1977). Entter mix old and new hardware and software technology using self-designed and -coded programsand often surprise audiences with special setups such as LED (light-emitting diode) wall. VJ, visual artist and more. "Raquel Meyers's vividly animated videos for chiptuners like Jellica, Bubblyfish, and Glomag mirror the music's retro-tech aesthetic with 8-bit visuals and narrative elements lifted from the era of 2-D videogames." "I have been making videoclips, art installations, tv commercials, organized music events, gave workshops and lectures, doing monthly radioshows and started my own classical music project called the c64 orchestra. I'm still using unconventional computers, the same amiga 1200's that started the low-res adventure 9 years ago and heading for the 10th anniversary next year." 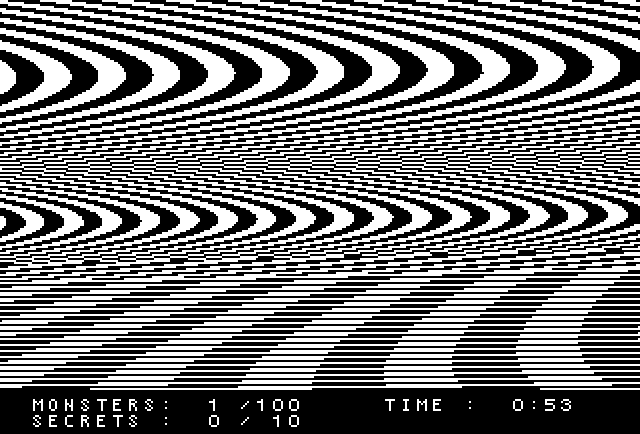 Julien Ducourthial aka o+ro / otromatic is a veejay graphician creating visuals with low-tech machines such as commodore amigas & gp2x handhelds. Influenced by demoscene (underground scene producing audio/video productions on computers in the eighties/nineties), comics and graphic design. His productions melt experimentations videos & graphic collages from various elements (icons, scans, freewares), renewing the aesthetic & reading from these formatted graphic codes. After the releases of fanzines & original covers for different artists (Bodenstandig 2000, Mesu Kasumai, Rico Zerone...) & labels (8Bit Peoples, Retinascan, Receptors), Otromatic now focuses on researches & new works on his website Ilbm (InterLeaved BitMap) exploring the frontiers between pixel-art, abstraction & design. With more than 200 dates since 2003, KISSDUB is present on different festivals, concerts or artistic events. His visual acts have gone along with numerous bands, djs, national and international live artists. Constantly going through and being an artist with a flexible identity, VJkissdub gives visual acts essentially in reaction to sounds. Using his taste and his cultural experience for the needs of the sounds he means to illustrate, he interprets on a wide screen the throbs of music and the colours of the event. His sources of inspiration are diverse : from experimental cinema to architecture, from game art to graffiti art, from baroque to writing and from web culture to television. This video shows a super alpha version of my pattern maker for the Gameboy Advance written in a hurry for Blipfestival 2007. Since then more features have been added. It is similar to my gp2x applications - equations that are varied via the d-pad and buttons. using my own custom software to turn hand held game systems such as the gp2x and gameboy advance into visual performance instruments. low-tech music for high-tech people - the ultimate digital sound community. The Micromusic community consists of musicians, visualists and other members from all over the world. 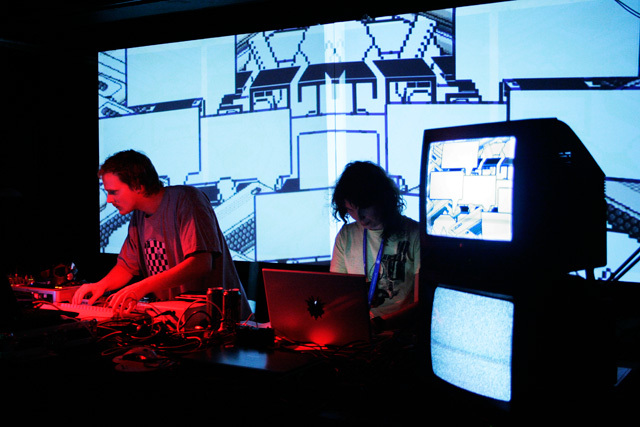 They strive to revive old hardware and use them as musical instruments or for the creation of lofi graphics. Mazemod is a web radio dedicated to amiga & tracker music culture streaming various styles of computer electronic music from the demoscene & computer art subculture. There are loads of archives with music, ofcourse. This are the ones I know of that are chiptune related though. There must be more... Any additives are appreciated! I am not watching a lot of MTV, so I might not be very up to date. Please add other videos you know of. Zero 7 - In the Waiting Line. Made in Quake 3 engine. The first Machinima music video to air on MTV. grey line between new game and mod. challenge the illusion of freedom in videogames. Douglas Gayeton spent nearly a year inside an online world called Second Life. Trip to Nowhere from Entter on Vimeo. 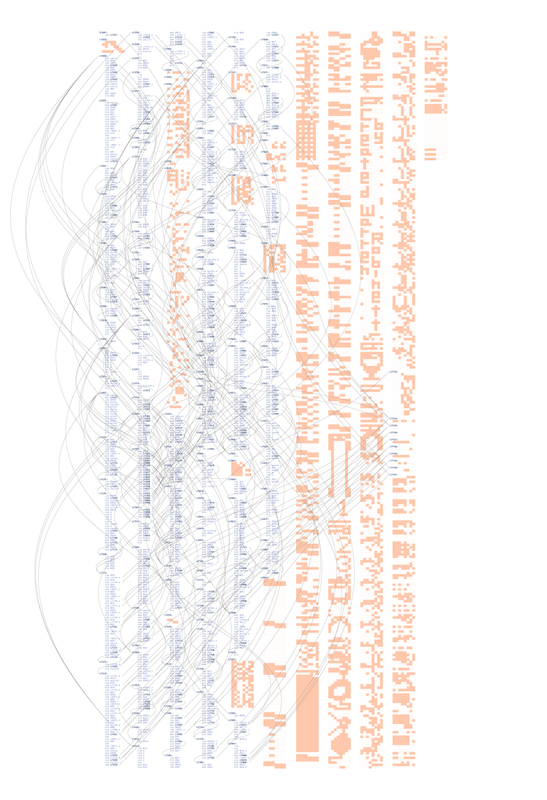 this was an early attempt to track bot movement and visualise it. The colour was added in a later process, this data was run through the system alot! All artworks have been created using data from the game "Unreal Tournament". 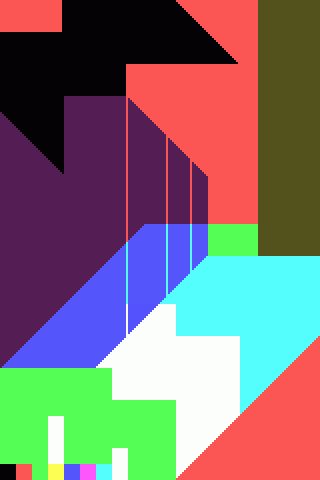 Each image represents about 30 mins of gameplay in which the computers AI plays against itself. There are 20-25 bots playing each game and they play custom maps which I create. Each map has been specially designed so that the AI bots have a rough idea of where to go in order to create the image I want. I log the position (X,Y,Z) of each bot, every second using a modification for the game, I also log the position of a death. I then run my own program written in Processing to create printable postscript files of that match. Super Mario Clouds is based on the Super Mario game for Nintendo’s NES game console. Cory Arcangel hacked the game and modified it so that all that remains of the game are the white clouds on a blue sky. Gone is the main character, Super Mario, who the player had to guide through a labyrinth in the original jump and run game, just like the obstacles, landscapes and opponents that lend the game its narrative structure. Those people who are familiar with the game can imagine them on the empty background, everyone else will just see the cartoon-like display of a sky. 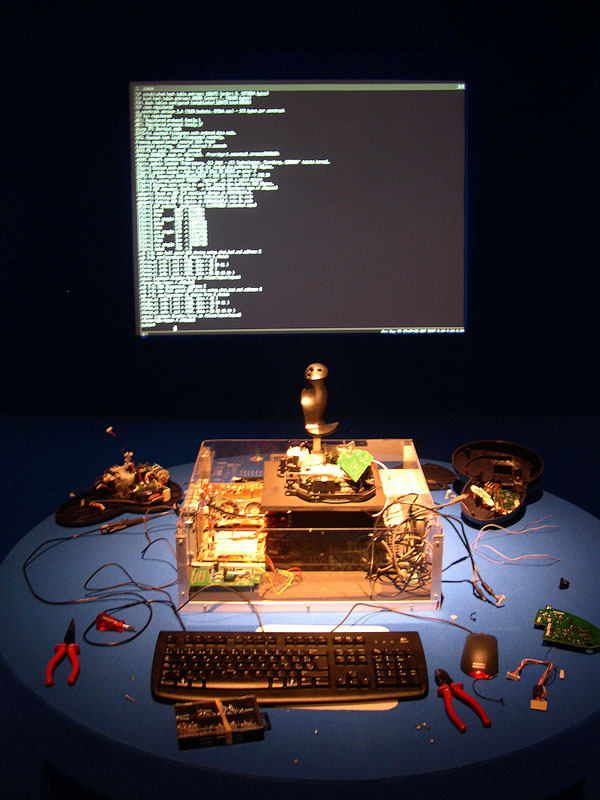 The work was created on the basis of a manipulation of the hardware and software. Cory Arcangel had to open the cartridge, on which the game was stored, and replace the Nintendo graphics chip with a chip on which he had burned a program he had written himself. Cory Arcangel is a member of the Beige Programming Ensemble who have focused their artistic programme on the hacking ethic of manipulating existing technology, thereby taking the modification of legacy technology to absurd extremes: the group have published computer programs pressed on records and organise an annual competition for cassette disk jockeys. Speedrunning could be described as the older brother of Machinima. A speedrun is a recording of a play-through of a videogame performed, with the intent of completing it as quickly as possible, mainly for the purposes of entertainment and competition. This work commenced in March of 2006, to roughly coincide with the 3rd anniversary of the start of the Iraq conflict. I enter the online US Army recruiting game, "America's Army", in order to manually type the name, age, service branch and date of death of each service person who has died to date in Iraq. The work is essentially a fleeting, online memorial to those military personnel who have been killed in this ongoing conflict. My actions are also intended as a cautionary gesture. I enter the game using as my login name, "dead-in-iraq" and proceed to type the names using the game's text messaging system. As is my usual practice when creating such an intervention, I am a neutral visitor as I do not participate in the proscribed mayhem. Rather, I stand in position and type until I am killed. After death, I hover over my dead avatar's body and continue to type. Upon being re-incarnated in the next round, I continue the cycle. As of 5/3/08, I have input 4002 names. I intend to keep doing so until the end of this war. As of this date there have been 4066 American service persons killed in Iraq. Adam Killer is a modification of the commercial game Half Life. Condon exploits a bug in the Half Life engine to create harsh trailing effects, turning the screen into a chaotic mess of bloody, fractured textures. Players have no option other than to shoot at the benign central character, Adam, who appears in multiples. Using iconography to invade public space. Also see the original website. My personal Flickrinvaded project (click on a photo to see my graffiti). A playable on-line re-creation of the ATARI classic, 'Space Invaders' where instead of fending off pixelly alien invaders, you must defend yourself against paragraphs of philosophical text taken from Michel Foucault's essay, 'What is an Author?' 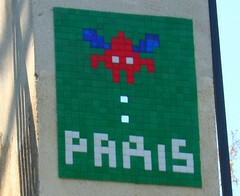 This game assumes the classic format of Space Invaders, but instead of shooting UFOs, the player must destroy a descending paragraph excerpted from Michel Foucault's essay, "What is an Author?" In destroying the passage word by word the player metaphorically deconstructs Foucalt's text which itself deconstructs the idea of the author. After shooting a few words, a "Yahoo!" search page appears on the screen with results defined by the eradicated words. This forces the player back into the Internet which is a platform for the death of the author on a daily basis. There will also be a 'game-day' (gaming on the big screen) on January 17th, from 9.00 - 17.00 (depending on the number of participants). The game that will be played is Battlefield 2, but you can also bring your own favorite game and we will see if we can find an opportunity to play it. 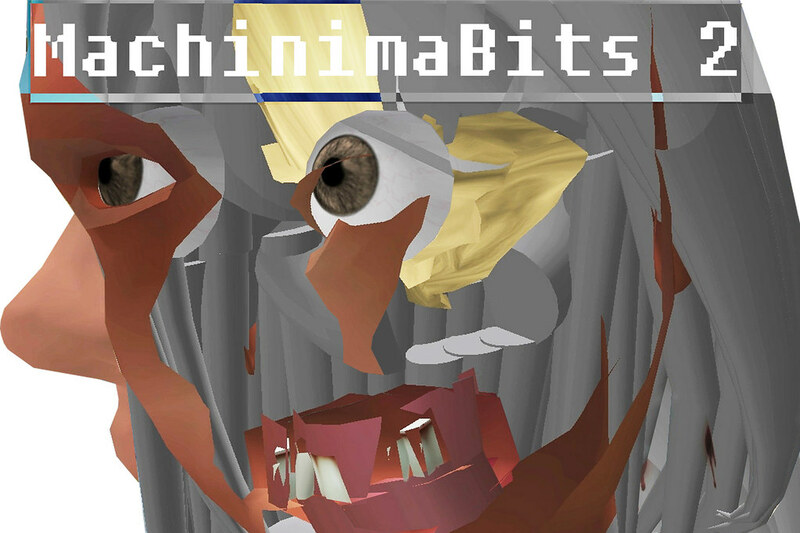 Machinima is a blend of machine, cinema and animation. It is the production of (short) films within a game-engine. In 2006 we organized the first MachinimaBits festival. Since then, we find that focussing on videogames in such a confined way excludes a lot of the more interesting, arguably border-line practices. This year we would like to broaden our scope and focus on the use of videogame (technologies) in terms of appropriation. To appropriate something involves taking possession of (parts of) it. The term appropriation often refers to the use of borrowed elements in the creation of a new work. The borrowed elements may include images, forms or styles.